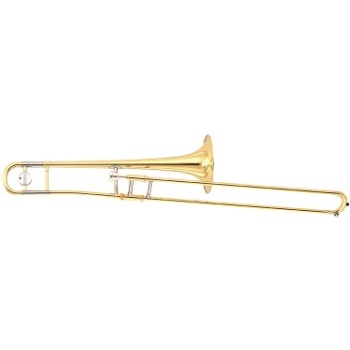 A Nickel-silver Outer Slide Promotes Added Durability Along With A Redesigned Case Makes This The Perfect Advantage Trombone. THIS TROMBONE QUALIFIES FOR JACKSON'S "RENT TO OWN INSTRUMENT PROGRAM". INNER SLIDE: The chrome-plated yellow brass drawn inner slide is very durable and has a quick, sensitive response. OUTER SLIDE: The one-piece drawn yellow brass outer slide maintains an accurate diameter throughout its length and this type of construction ensures, airtightness, smooth action, and exceptional durability and adds resonance to the sound. TUBULAR BRACES: Long-lasting nickel-silver tubular braces contribute to the stability of the slide and enhance smooth slide action. BALANCER: The balancer found on the YSL-200AD perfectly proportions the instrument's weight. PRESSURE FORMED TUBING: Perfectly rounded tubing results in less turbulence and a smoother air flow, thus allowing for an excellent scale and reduced resistance. LASER-FUSED PLUZUMA WELDED BELL: A high-energy laser fuses the brass together for a virtually seamless bell which allows continuous even vibrations. SLIDE LOCK: The unique slide lock design on all Yamaha trombones keeps the slide locked in place and keeps it from accidentally falling. WEIGHT DESTRIBUTION: Beginners are more comfortable playing the YSL-200AD because its superb weight distribution makes it easier to hold. BRACING: The large, easy-to-hold nickel silver bracing guards against possible slide damage if the instrument is dropped and also lessens fatigue while playing. MOUTHPIPE: Yamaha trombones have mouthpipes featuring special acoustic designs allowing for precise intonation and greater blowing control.